The Victoria Police Blue Ribbon Foundation regularly attends various community events across Victoria and our branches also run events within their regions. A great nig ht out with fabulous entertainment whilst raising funds for local hospital projects. This year, we are thrilled that Tim Campbell and his band will keep you on the dance floor. Tim is well known actor, singer, host and has ventured into musical theatre (Johnny O’Keefe/Shout, Wicked/Hairspray & Grease). 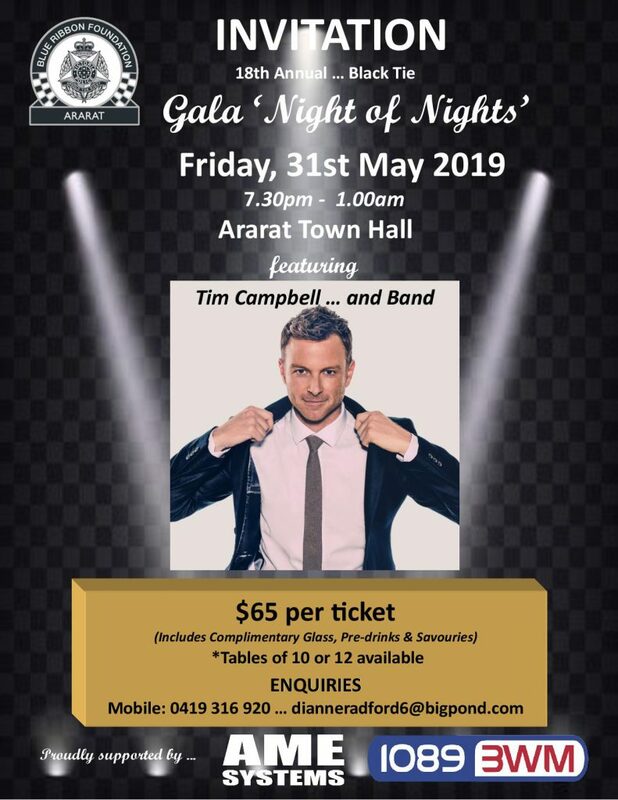 Tim is one of Australia’s most versatile and much loved entertainers, performing the classic 70s and 80s dance floor hits with his band. Tickets : $65 which includes pre-drinks and savouries. Enjoy an evening of fine food, drinks and entertainment featuring Code One Rock Band and special guest hosts. Tickets : $130 includes three course meal and drinks. Dress: 50’s Fashion, Dinner Suit or Cocktail.